A wide variety of cloth, synthetic fabric and paper wipers and dispensers for virtually every industrial and commercial application, including commercial cleaning, distribution, food service, manufacturing and technology assembly. Wipers are used for cleanup, maintenance and other operations like final polishing in electrical shops, machine shops, painting and maintenance departments. When used properly, they can increase efficiency and safety. While synthetic wipers are highly efficient and solvent resistant, cloth wipers can be used for a wider variety of applications. In addition, use is more orderly and more efficient and usage levels can be controlled more effectively with the use of dispensers. Using dispensers means that employees are more likely to take only the wipers needed for a specific job, and supplies of wipers will not collect in work areas, become soiled and be discarded unused. Wipers containing hazardous liquids and materials should not be discarded with the regular trash. Hazardous liquids and materials should be disposed of only in special containers, to avoid the risk of contamination and fire. A good general rule in all commercial and industrial operations is that the safe, careful way saves time and money in the long run. Wipers, manufactured by leaders like DuPont, Fort James, IFC Disposables and Unisan, contain cotton, polyester and cellulose materials. Cloth wipers are available in 5 lb. bags, 25 lb. cartons and large bales. 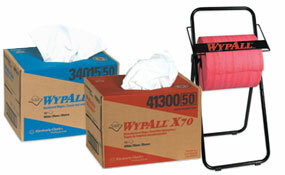 Synthetic wipers come in rolls, dispenser boxes, bulk packs and banded bundles. Wipers can be job-engineered for specific qualities, like lint free and specific sizes of rolls, sheets and dispensers.